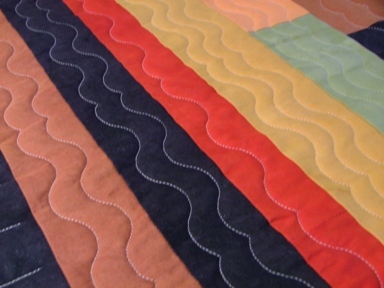 Once in a while, it's fun to combine the precision of computerized quilting with a little bit of freehand stitching. 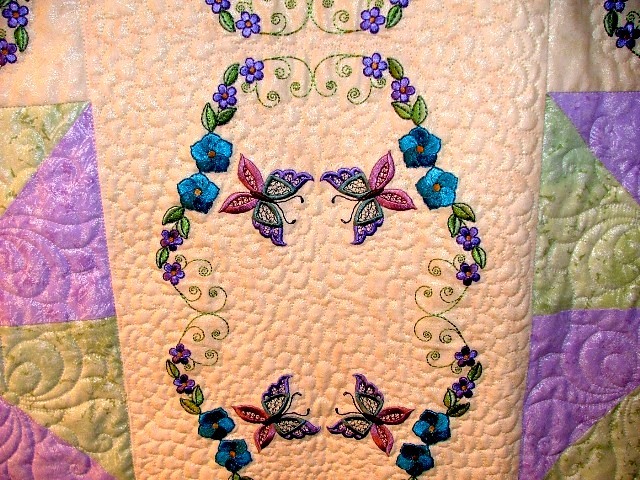 Both methods were used to complete a quilt featuring an embroidery collection called "Butterflies and Flowers 2" from Priscilla Madsen of Madsen Originals. 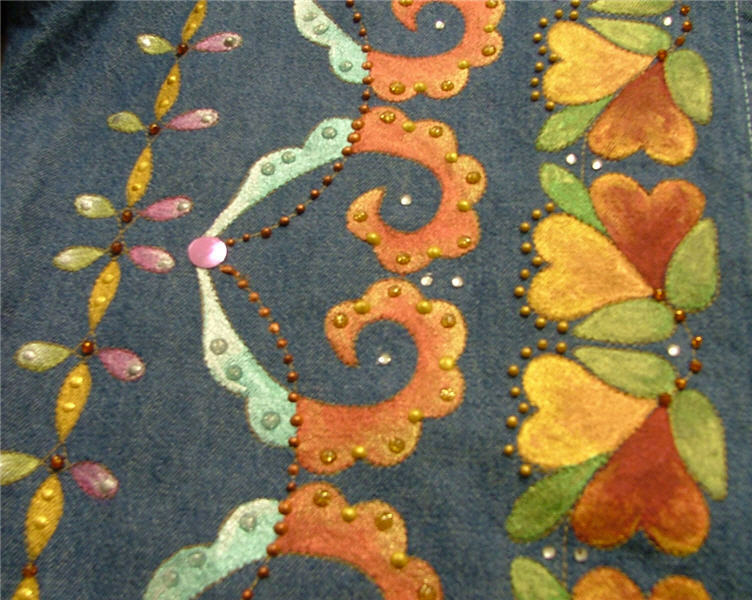 Make sure to see the close-up pictures of this beautiful embroidery! 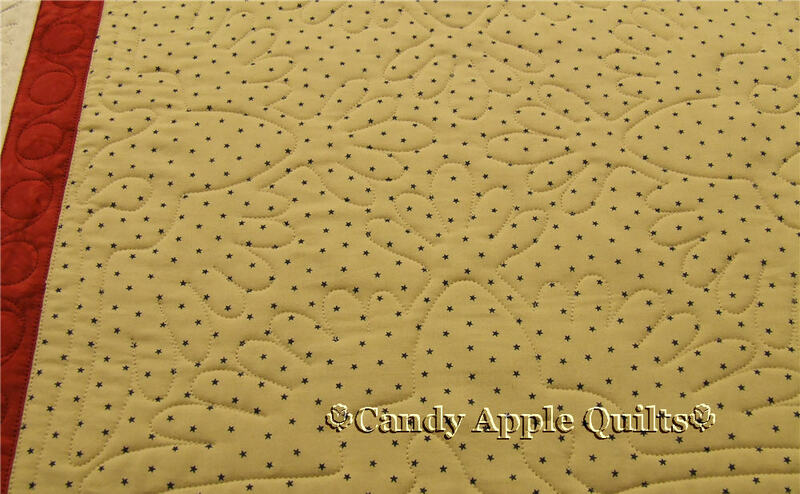 Ellen brought this quilt in to me the other day, and she had the perfect vision of how she wanted it quilted! Her perfect piecing made my job pure pleasure. We used the stand-alone feature of Creative Studio software to plan out her vision, and then executed her ideas to reflect her wonderful choices! 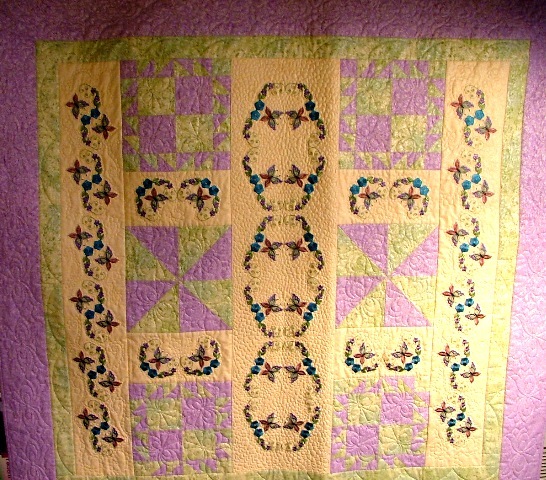 I did a little research on the women of Gees Bend and found their web site, The Quilts of Gee's Bend, Quilters Collective History, here. 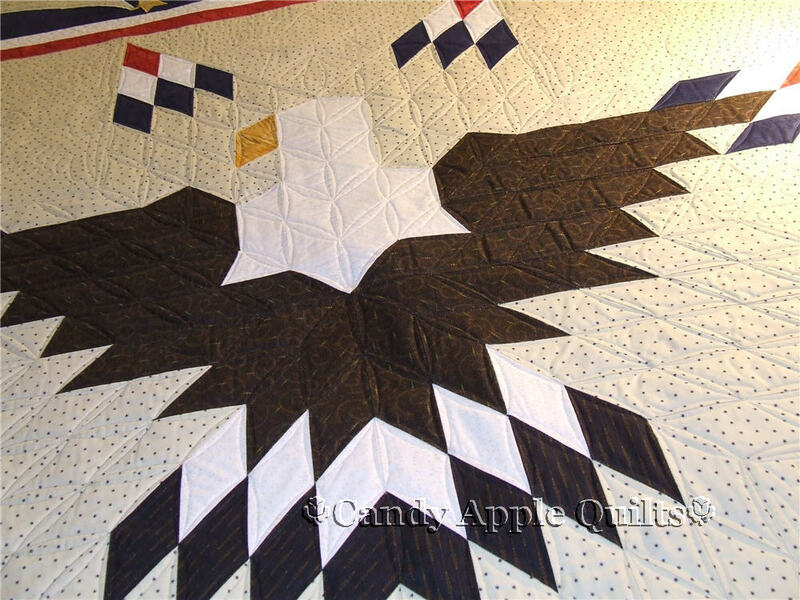 According to the web site, "The women of the Gee's Bend Quilters Collective all live in the area of Rehoboth and Boykin, Alabama.Throughout much of the twentieth century, making quilts was considered a domestic responsibility for women in Gee's Bend. 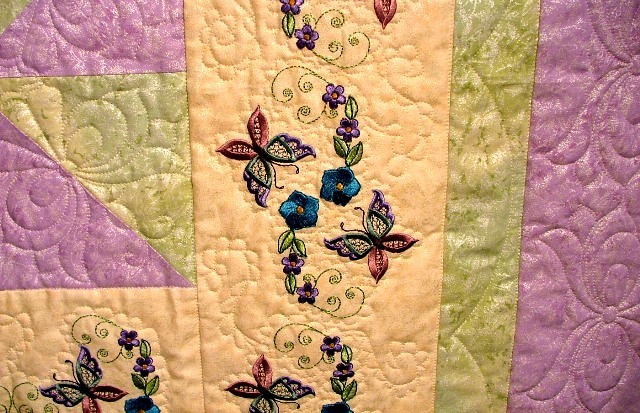 As young girls, many of the women trained or apprenticed in their craft with their mothers, female relatives, or friends; other quilters, however, have been virtually self-taught. 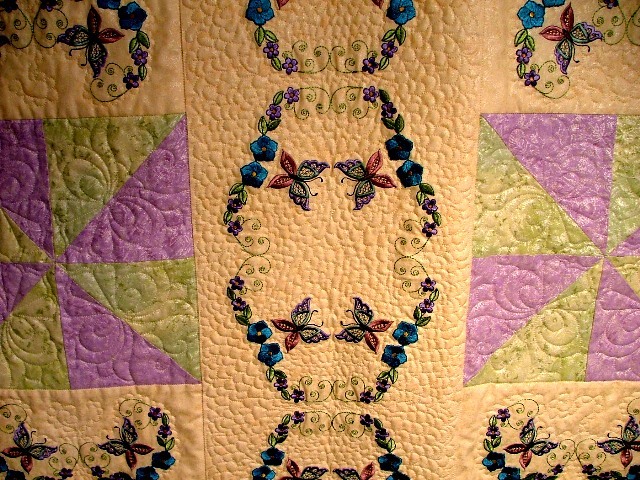 Women with large families often made dozens upon dozens of quilts over the course of their lives." You can meet these amazing women here. 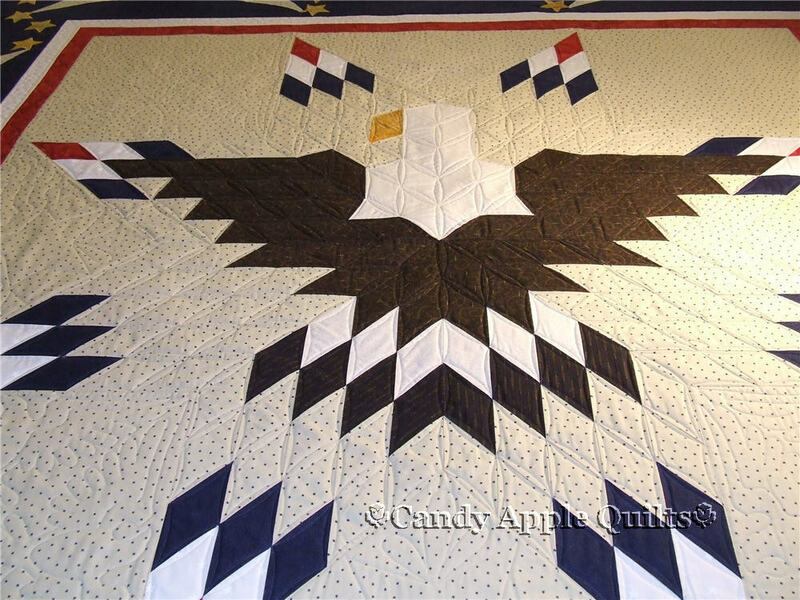 I look forward to seeing more of these quilts! 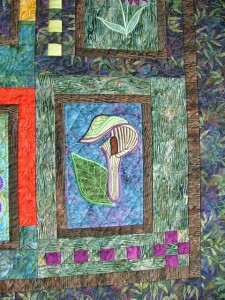 Be sure to look at the various pictures so you can appreciate Ellen's quilt! I was lucky to receive this quilt done by Lyn Christian of A Design by Lyn. The colors are amazing, and the flowers are gorgeous! She is truly and artist! If you have a chance to go to Lexington, Kentucky to take a class taught by Lyn, you will never forget it! I'm going to let her tell her story here about her thoughts and experiences making this quilt. 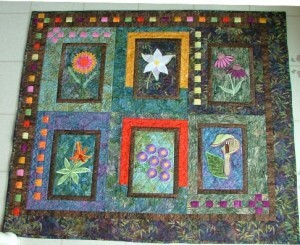 I will be teaching this class at my local shop "Q is for Quilting", here in Lexington, Kentucky. When I was asked to teach this class, I thought WOW...this should be fun! I looked at the pattern and I immediately remembered being a child growing up in Wisconsin. The forest floor had wonderful spots of sunlight and there were bursts of colors from the amazing flowers and ferns. Excitedly, I researched the flower names and what the colors would be. The trillium was the first one I researched. I know wild trilliums to be WHITE with just a tiny touch of pink as they start to fade. You can look into the Wisconsin woods on a spring day and think there is fresh snow on the ground because the trilliums truly carpet the forest floor. 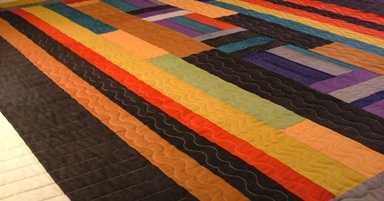 The colors on the quilt pattern were deep orangey reds and such. I decided to use a bit of creative license -- I wanted my version of this quilt to have what I remembered for colors of these flowers as I walked with my mom and dad. After all, there are no quilt police that will take my pattern away if I don't follow it word by word and color by color and fabric by fabric! So off I went on a new adventure -- choosing fabrics! This pattern is a great one to let you bring lots of YOU into it. 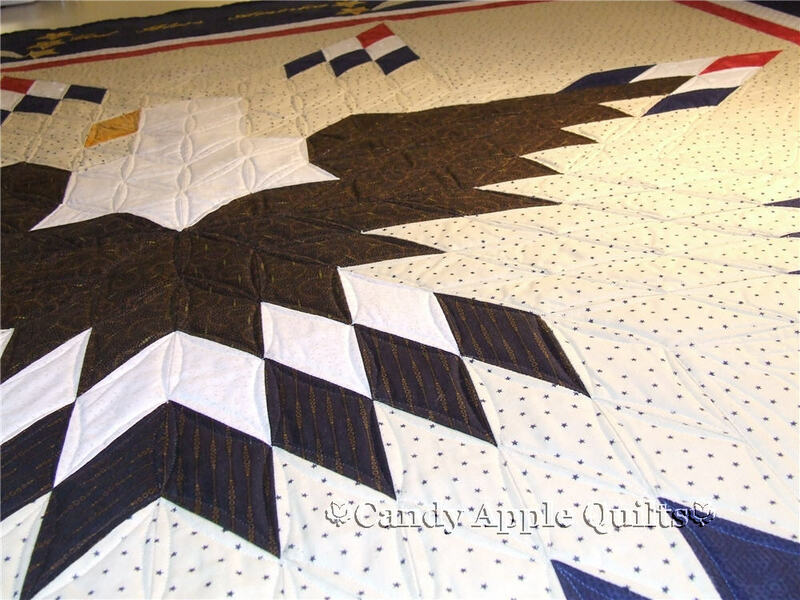 I can visualize this quilt done in colors of the sky (with blues and pastels), to colors of the earth and forest (like I have done), to calico patchworks of the fields. Let your imagination be your guide as you choose your fabrics. In this quilt, many of the borders and sashes are different...as are the trees, and plants and foundations of the forest floor -- but I think it would be as beautiful done simply, with just a few choice fabrics that are well loved. It would feel like a planned garden, peaceful and serene. 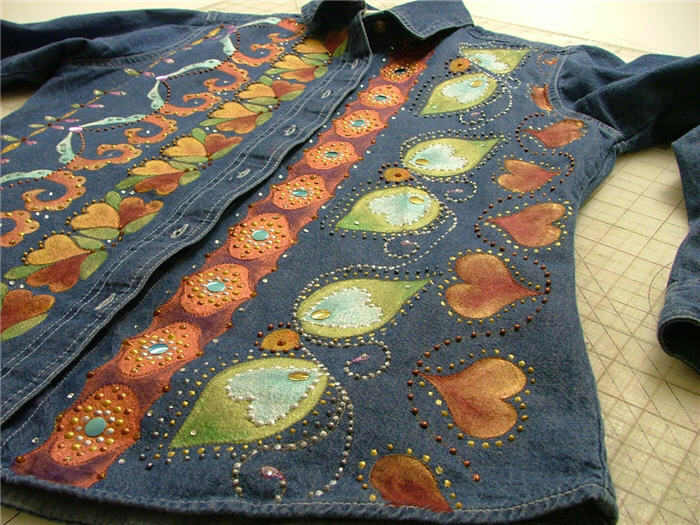 There is a method for doing applique included with the pattern. I use an alternate method for all of my applique designs, and I was certain that my method would work for these designs too. I wrote to the designer, and asked for permission to rework the designs so I could teach my method of applique to my students.The designer was great and gave me permission to do just that. 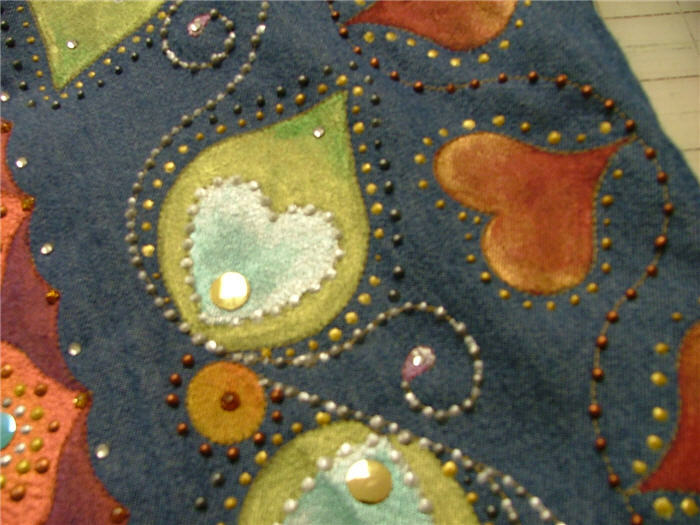 I changed the steps for marking and tack down, and this has really simplified the process for the applique. 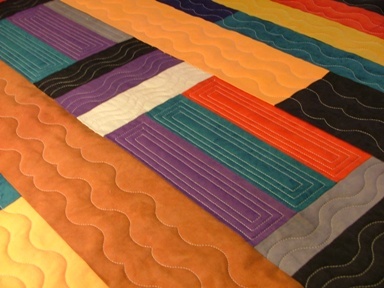 Making small changes can really have a big impact in your quilts! 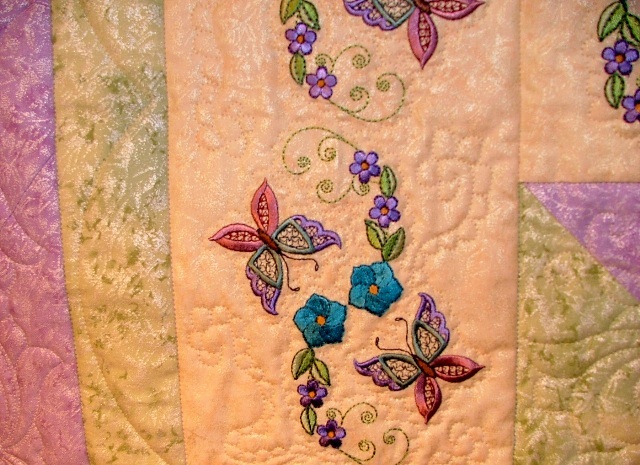 This alternate applique method has brought those blooms right off the fabric! 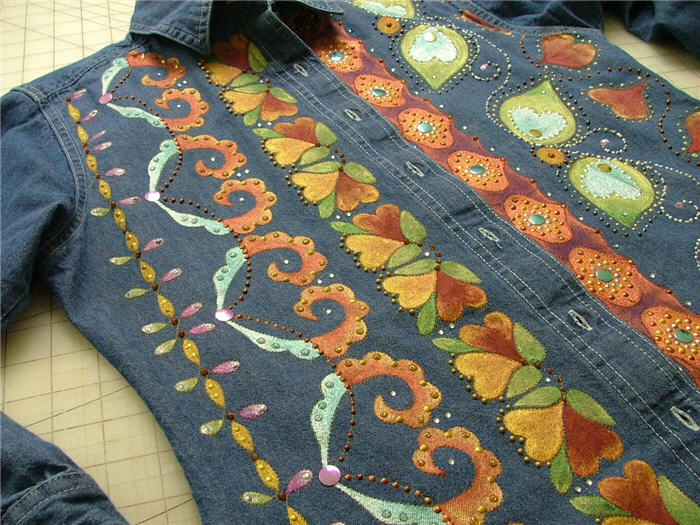 I also took away some of the secondary fabrics on the centers and chose embroidery threads that would add dimension. My next step is to add some very tiny crystals in matching colors -- I want it to seem as if drops of dew have formed in a few places to catch a fracture of light and draw the eye to the quilt. I added dimension to some of the flowers using specialty fabrics like ultra suede and dimensional fabrics for stamens and such to bring it off the flat background. This was a fun project to do, and it really gave me the opportunity to think outside the box. This pattern is available directly from Smith Street Designs, and includes directions for multiple sizes. And if you are near the Lexington, Kentucky area stop into the shop and take a class -- I guarantee you will have fun!" Summer is truly gone. When sunflowers are in bloom, we know the end is near. Now that all signs of the sunflowers have disappeared, we know it's time to settle in and watch the falling leaves change to falling snow flakes. My friend June has created a way to enjoy her favorite sunflowers all year. She stitched this wall-hanging in bright and bold colors that are guaranteed to keep the winter blues at bay. Just take a peek at her creative corners! These notched corners will be fun to bind, and will lend an intrigueing shape to this kitchen wall-hanging project. 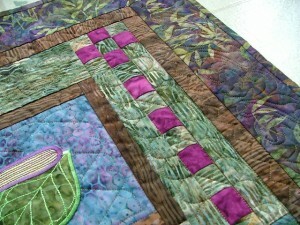 Surrounding the central area, you will find lots of bright colors that are taken from the quilt background. 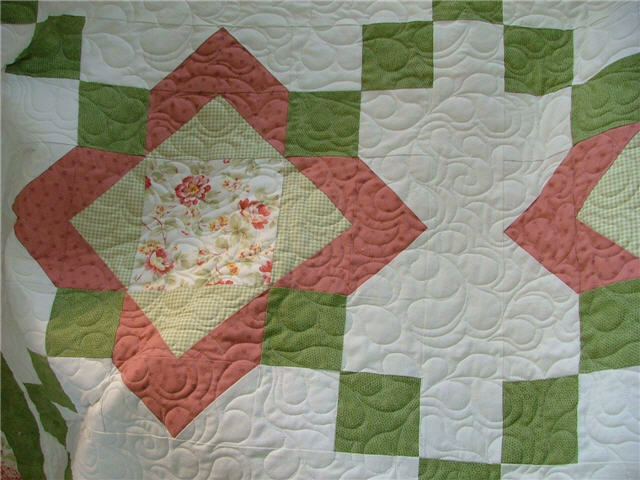 Each tiny area was quilted separately. 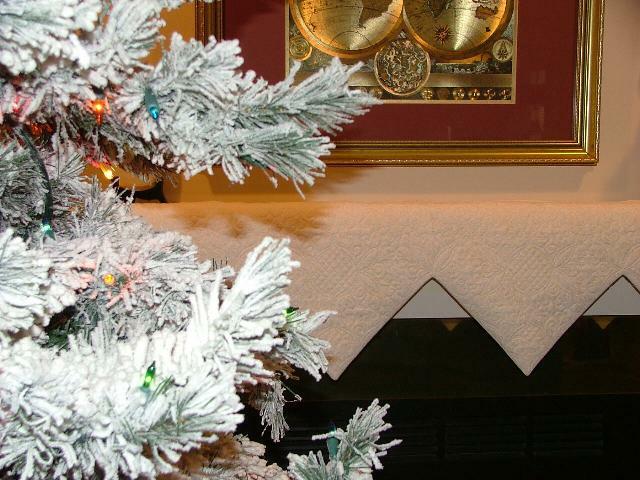 The finished project will be warming hearts all year long. Click on each picture for larger versions. 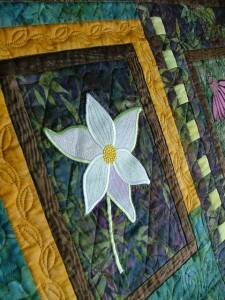 I hope you enjoy the pictures as much as I enjoyed working on this quilt! 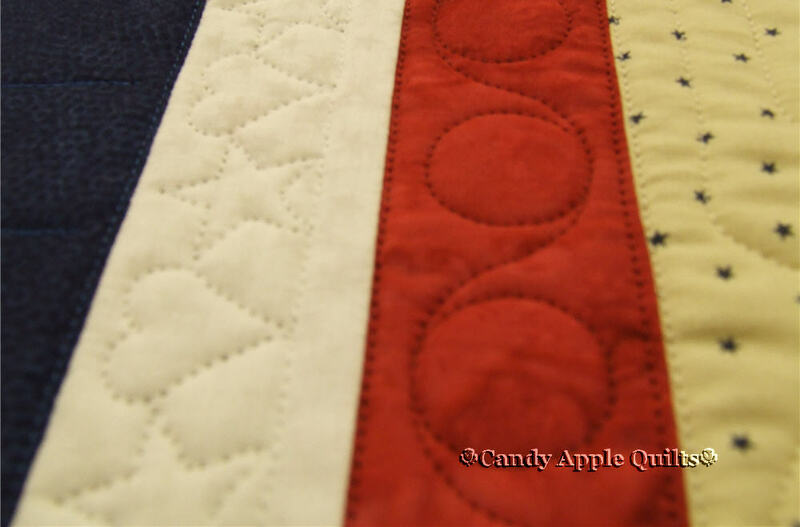 Just a quick announcement to let everone know that we have joined the Quilt Bloggers! I received this little video today from a very kind gentleman, and I just had to share it with you! Neither of us can find the originator of it, but it's not from lack of trying.... This displays how a stitch is formed. You can see how the rotary hook spins around, capturing the thread from the needle, and actually forming the stitch. 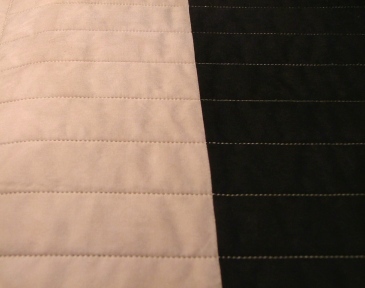 If your top tension is too tight, the rotary hook cannot form the stitch, and you will have skipped stitches throughout your quilt top.